The krone [ˈkruːnə] (sign: kr; code: NOK), plural kroner, is the currency of Norway and its dependent territories. It is subdivided into 100 øre, which have existed only electronically since 2012. The name translates into English as crown. The krone was the thirteenth most traded currency in the world by value in April 2010, down three positions from 2007. 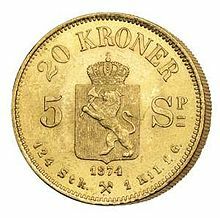 The krone was introduced in 1875, replacing the Norwegian speciedaler/spesidaler at a rate of 4 kroner = 1 speciedaler. In doing so, Norway joined the Scandinavian Monetary Union, which had been established in 1873. The Union persisted until 1914. After its dissolution, Denmark, Norway, and Sweden all decided to keep the names of their respective and since then separate currencies. Within the Scandinavian Monetary Union, the krone was on a gold standard of 2,480 kroner = 1 kilogram of pure gold (1 krone = 403.226 milligrams gold). This gold standard was restored between 1916 and 1920 and again in 1928. It was suspended permanently in 1931, when a peg to the British pound of 19.9 kroner = 1 pound was established. (The previous rate had been 18.16 kroner = 1 pound). In 1939, Norway pegged the krone temporarily to the U.S. dollar at a rate of 4.4 kroner = 1 dollar. Nonetheless, Norway would continue to hold the Kingdom's gold reserves. During the German occupation (1940–1945) in the Second World War, the krone was initially pegged to the Reichsmark at a rate of 1 krone = 0.6 Reichsmark, later reduced to 0.57. After the war, a rate of 20 kroner = 1 pound (4.963 kroner = 1 U.S. dollar) was established. The rate to the pound was maintained in 1949, when the pound devalued relative to the U.S. dollar, leading to a rate of 7.142 kroner = 1 U.S. dollar. In December 1992, the Central Bank of Norway abandoned the fixed exchange rate in favor of a floating exchange rate (managed float) due to the heavy speculation against the Norwegian currency in the early 1990s, which lost[clarification needed] the central bank around two billion kroner in defensive purchases of the NOK through usage of foreign currency reserves for a relatively short period of time. In 1875, coins were introduced (some dated 1874) in denominations of 10 and 50 øre and 1 and 10 kroner. These coins also bore the denomination in the previous currency, as 3, 15, and 30 skillings and 2½ specidaler. Between 1875 and 1878, the new coinage was introduced in full, in denominations of 1, 2, 5, 10, 25, and 50 øre and 1, 2, and 10 kroner. The 1, 2, and 5 øre were struck in bronze; the 10, 25, and 50 øre and 1 and 2 kroner, in silver; and the 10 and 20 kroner, in gold. The last gold coins were issued in 1910; silver was replaced by cupro-nickel from 1920. Between 1917 and 1921, iron temporarily replaced bronze. 1917 also saw the last issuance of 2 kroner coins. During the German occupation of Norway in the Second World War, zinc was used in place of cupro-nickel in 10, 25, and 50 øre coins, and production of the 1 krone piece was suspended. The obverse of a 1940 Norwegian krone. The reverse of the 1940 krone. In 1963, 5 kroner coins were introduced. Production of 1 and 2 øre coins ceased in 1972. The following year, the size of the 5 øre coin was reduced; production of the denomination ceased in 1982, along with minting of the 25 øre. Ten-kroner coins were introduced in 1983. In 1992, the last 10 øre coins were minted. Between 1994 and 1998, a new coinage was introduced, consisting of 50 øre, 1, 5, 10, and 20 kroner. These are the only coins which are currently legal tender, with the exception of the 50-øre coin which was withdrawn on 1 May 2012. It was withdrawn because it was no longer circulating as an ordinary coin used for payment. However, banks in Norway will still exchange 50 øre coins for higher values until 2022. The 10- and 20-kroner coins carry the effigy of the current monarch. Previously the 1- and 5-kroner coins also carried the royal effigy, but now these denominations are decorated only with stylistic royal or national symbols. The royal motto of the monarch (King Harald's motto is Alt for Norge, meaning "Everything for Norway") is also inscribed on the 10-kroner coin. Coins and banknotes of the Norwegian krone are distributed by the Central Bank of Norway. Up to 25 coins of any single denomination is considered tvungent betalingsmiddel—a legally recognized method of payment, in which the intended recipient can not refuse payment, according to Norwegian law. The characteristics of the 10 Syrian pound (10 SYP) coin have been found to so closely resemble the 20 Norwegian kroner (20 NOK) coin that it can fool vending machines, coins-to-cash machines, arcade machines, and any other coin-operated, automated service machine in the country. Whilst they are hardly similar to the naked eye, machines are unable to tell the coins apart, owing to their almost identical weight and size. As of mid February 2017, 10 Syrian pounds were worth 39 øre, making the 20-kroner coin 51.5 times more valuable than the 10-pound coin. While not easy to find in Norway, the Syrian coins are still used in automated machines there with such frequency that Posten Norge, the Norwegian postal service, decided to close many of their coins-to-cash machines on 18 February 2006, with plans to develop a system able to differentiate between the two coins. In the summer of 2005, a Norwegian man was sentenced to 30 days, suspended, for having used Syrian coins in arcade machines in the municipality of Bærum. In 1877, Norges Bank introduced notes for 5, 10, 50, 100, 500 and 1000 kroner. In 1917, 1-krone notes were issued, and 2-kroner notes were issued between 1918 and 1922. Because of metal shortages, 1- and 2-kroner notes were again issued between 1940 and 1950. In 1963, 5-kroner notes were replaced by coins, with the same happening to the 10-kroner notes in 1984. 200-kroner notes were introduced in 1994. The cost of one Euro in Norwegian krone (from 1999). The value of Norwegian krone compared to other currencies varies considerably from one year to another, mainly based on changes in oil prices and interest rates. In 2002 the Norwegian krone grew to record high levels against the United States dollar and the Euro. On 2 January 2002, 100 NOK were worth 11.14 USD (1 USD = 8.98 NOK). In July 2002, the krone hit a high at 100 NOK = 13.7 USD (1 USD = 7.36 NOK). In addition to the high level of interest, which increased further on 4 July 2002, to 7 per cent, the price of oil was high. At the time Norway was the world's third largest oil exporter. In 2005, oil prices reached record levels of more than 60 dollars per barrel. Although interest rates had decreased to around 2 per cent, the Norwegian krone grew even stronger. However, in late 2007 and early 2008, the USD suffered a steady depreciation against all other major currencies. The Norwegian krone was gaining value at the same time; as a result, the Norwegian krone became stronger than ever compared to the USD, making the USD worth about 5 NOK in April 2008. By October 2008, the USD had recovered and was worth approximately 7 NOK. Following 2009, the NOK has once again seen strong growth, making the USD worth about 5.8 NOK as of the beginning of 2010. Since then, the USD has gone up further and as of mid 2016 is worth about 8.5 NOK. The Norwegian krone is used in Norway including Svalbard. It is also informally accepted in many shops in Sweden and Finland that are close to the Norwegian border, and also in some shops in the Danish ferry ports of Hirtshals and Frederikshavn. Norwegians spent 14.1 billion NOK on border shopping in 2015 compared to 10.5 billion NOK spent in 2010. Border shopping is a fairly common practice amongst Norwegians, though it is seldom done on impulse. Money is spent mainly on food articles, alcohol and tobacco, in that order, usually in bulk or large quantities. This is due to considerably higher taxes and fees on tobacco and alcohol purchased domestically in Norway. ^ Andersen, Øystein (2006-02-18). "Myntsvindlere herjer i Oslo". Dagbladet (in Norwegian). DB Medialab AS. Retrieved 2008-03-08. ^ "Mest mat i handlekurven" (in Norwegian Bokmål). ssb.no. Retrieved 2016-04-12. ^ "NOK 14.1 billion in cross border trade". ssb.no. Retrieved 2016-04-12. Factors that influence the krone exchange rate, information from Norges Bank in 2000. This page was last edited on 3 April 2019, at 21:44 (UTC).